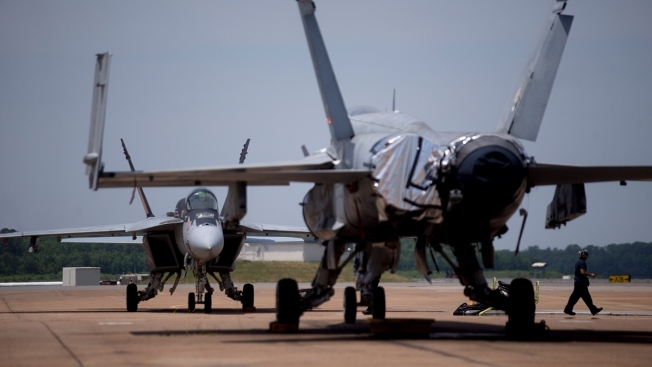 A Boeing Co. F/A-18E Super Hornet aircraft, left, sits on the flight line at the Naval Air Station (NAS) Oceana in Virginia Beach, Virginia, June 19, 2014. Navy officials say a female sailor was wounded in a "domestic" shooting in a Virginia base parking lot and security fatally shot the shooter, a male sailor. Navy mid-Atlantic region officials said in a statement that the shooting took place early Friday morning in a Strike Fighter Squadron 37 hangar parking lot at Naval Air Station Oceana in Virginia Beach. Officials say security responded to the shooting and fatally shot the male sailor. They say the female sailor was taken to a hospital with multiple gunshot wounds that aren't thought to be life-threatening. The shooting happened at 6:45 a.m. and "the situation was resolved" within five minutes, the Naval Air Station said on its Facebook page. The station, the Navy's master jet base for fighters on the East Coast, had tweeted at 7:18 a.m. that it was on lockdown, saying "this is not a drill." It announced the lockdown was lifted about an hour later. Officials say normal base operations have resumed. Naval Air Station Oceana is home to 18 F/A-18 Hornet and Super Hornet squadrons. The base has about 10,500 active Navy personnel, 10,000 family members and 4,500 civilian personnel, according to its website. Officials say the base has a "no weapons policy" and the shooting is under investigation. ATTN: NAS Oceana lockdown has been lifted. NAS OCEANA experienced an Active Shooter incident. The shooter has been contained. The victim has been transported to the hospital. More information to follow. ATTN: This is not a drill. NAS Oceana is currently in lockdown due to a security incident. This is not a drill. NAS Oceana is under lockdown. All gates are closed, no base access at this time. There is currently a security situation according to Oceana PAO.